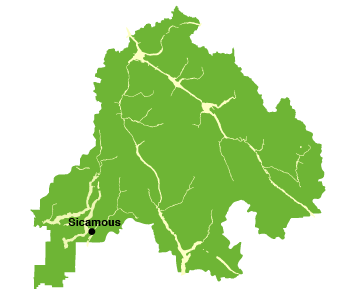 Sicamous is a district municipality in British Columbia located adjacent to the Trans-Canada Highway at the Highway 97A junction, where Mara Lake empties into Shuswap Lake via a short narrows. Sicamous is a resort town and is the eastern gateway to the Shuswap. With over 1,000 km of shoreline surrounding Sicamous it styles itself as the Houseboat Capital of Canada.